The Royal Palanquin with Four Poles, or Rajendrayan (Palanquin with Busabok Throne), is made of carved and gilded wood, and carried on four poles by 56 strong men. The palanquin is 4.23 meters high, 5.48 meters long, and 1.03 meters wide. The royal palanquin is used by the monarch in a grand procession known as the four-line procession, such as when the king proceeds from the royal residence in the Grand Palace to pay homage to the Emerald Buddha in the Temple of the Emerald Buddha on the occasion of the Royal Coronation Ceremony. 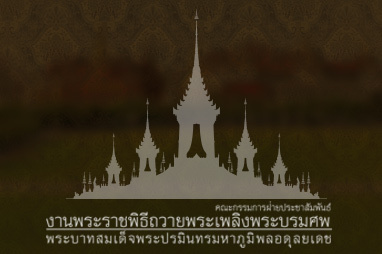 It is also used to transfer the royal Reliquary urn containing the royal relics of the king, the queen, or members of the royal family from the Royal Crematorium at Sanam Luang into the Grand Palace.